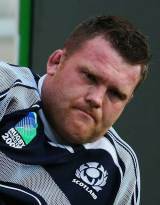 Scotland prop Allan Jacobsen made his international debut against Canada in 2002, but was forced to wait 15 months for his next appearance against Ireland. Jacobsen was called out to the Rugby World Cup in Australia as a replacement in 2003 but did not make an appearance. He has worked hard to establish his place in the Scotland setup, spending many years alternating between a starting slot and the bench, with several niggling injuries also hampering his progress. He finally made an impact on the World Cup in 2007, but not one that he is likely to remember fondly. Jacobsen lasted only part of their first game against Portugal before succumbing to a leg injury. He bounced back to take his place in the front-row for all of Scotland's games during the 2008 Six Nations, including their Calcutta Cup victory over England at Murrayfield. His good from ensured that he also started all three of Scotland's autumn internationals against New Zealand, South Africa and Canada. His consecutive appearances ran into the following year's Six Nations as he started against France, Wales and Italy. The prop made his 50th appearance for the national team against Samoa in November 2010 and started all five of Scotland's 2011 Six Nations games as Andy Robinson's side narrowly avoided the wooden spoon.